Buy 1 for $20.52Buy 2 / Save $1.10!Buy 3 / Save $4.11! The root can be used to help support "female problems," because it can help to balance hormones. It contains natural estrogen and helps promote the flow of normal menstrual blood and is beneficial in cases of painful or delayed menstruation. It can be used to help soothe ovarian cramps and womb cramping. Black Cohosh should not be used by pregnant women, but midwives use it at the end of pregnancy to encourage labour and help with childbirth pains. It soothes the nervous system and contains solicylates that make it anti-inflammatory. 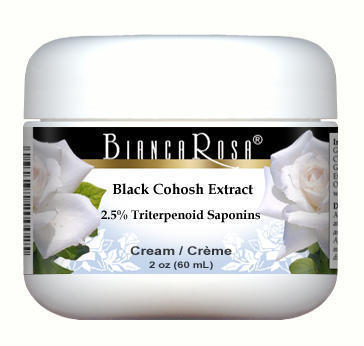 Black Cohosh has been used in supporting rheumatic pains, joint pain, muscular pain, sciatic, neuralgia, high blood pressure, hot flashes, sinusitis, asthma and other respiratory problems. This herb contains estrogenic sterols, glycosides, acctaeine, isoferulic acid, oleic acid, palmitic acid, pantothenic acid, phosphorus, racemosin, tannins, triterpenes, vitamin A and B5.